Boxing gloves can weigh anywhere from 8 to 20 ounces. That is a pretty big variance. The difference in weight is to account for the size of the person and what the gloves will be used for. A heavyweight professional boxer may choose to train in 18 to 20-ounce gloves, but that is over a pound of weight on each hand, and not fitting for the average person. On that same note, that heavyweight may not even be able to physically get his hand into a 10 or 12-ounce glove. When choosing a glove size, make sure that you are physically able to carry the weight of the glove. An average female, new to the sport will probably be just fine in 10-ounce gloves or even 12 ounces. That should provide enough weight for resistance and protection, but not be so heavy that technique fails. Again, most fitness classes will be primarily working on the heavy bag, though this is not always the case. If your class incorporates partner drills or defensive work, larger gloves or a different type of glove may be required. A larger size glove will provide additional protection for both you and your partner. 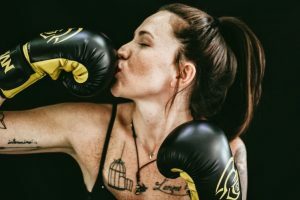 For an average size female 14-ounce gloves may be sufficient, but as a general rule, most boxing clubs that allow sparring will require gloves to be at least 16 ounces for all genders. Though they may all look virtually the same to the untrained eye, there are subtle differences in glove styles that make them more or less appropriate depending on use. In general, gloves with a Velcro closure, also called “hook & loop” are best fit for anything except competition. Competition gloves typically lace up like shoes but take significantly more time and assistance to get on and off. Choosing boxing gloves for your style of training is important. Classic Bag Gloves: Used for light bag work. There is less padding and protection. Sometimes the thumb is not covered. These are only recommended for very light work and not power punching. Modern Bag Gloves: These new versions look more similar to standard training gloves, providing more writs and knuckle support, but not enough to be appropriate for intense partner work. Sparring Gloves: The name says it. These gloves are meant for impacting someone’s face. They are usually a bit larger than other types of gloves and this is primarily for added protection to both the offensive and defensive partner. Training Gloves: An all-purpose piece of equipment, training gloves are a good way to go, especially if you are in a class that does both bag work and partner drills. Muay Thai/Kickboxing Gloves: In all honesty, these gloves usually have cooler designs. Thai fighters are known for wearing bright flashy colors, so the designs are usually pretty cool. One of the main differences in gloves made for these sports (that also involve kicking) is that they are often shaped to provide additional hand flexibility. This is necessary given that these sports allow clinching with the hand and catching/blocking kicks. Yes, it is important to find a pair of gloves that you think look super cool. 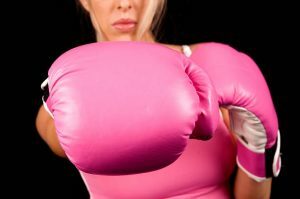 Everyone has their own style and being able to rock a pair of sweet bright pink or tiger striped gloves just might be what it takes to keep you motivated. A quick online search using keywords like “blood splattered boxing gloves” or “butterfly boxing gloves” should give you some cool options. Just don’t forget to keep all of the other factors in mind when choosing boxing gloves.